The Ghost has evolved. 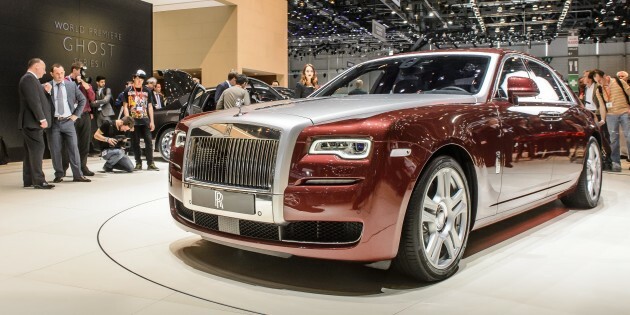 The Rolls-Royce Ghost, that is. Christened the Series II – the same naming convention used for the updated Phantom flagship – the junior Rolls-Royce debuted at the ongoing 2014 Geneva Motor Show with minor enhancements both inside and out. Plain to see are the redesigned headlights, now infused with LED daytime running lights, which are meant to make it look more distinctive from the front. It certainly works, unless you park it next to a Chrysler 300. Other changes include a new ‘wake channel’ behind the Spirit of Ecstasy and a re-sculptured front bumper. Inside, the Rolls-Royce Ghost Series II gains a few tech upgrades, including on-board Wi-Fi and Satellite Aided Transmission (SAT). The latter was introduced on the Wraith coupe, and uses GPS data to study and anticipate appropriate gearchanges to suit the upcoming road geometry and driving style. The user interface and navigation system have been updated as well, and now features a BMW iDrive-like touch-sensitive Spirit of Ecstasy Rotary Controller. An optional Bespoke Audio system is also available, in case you want to play music over the unchanged 563 hp/780 Nm 6.6 litre twin-turbo V12 engine. Nice rims. Very sporty looking, as it should be, considering its targeted for the “younger” executives/businessman. The HUD is a nice touch too. Would’ve wished for more power or better fuel efficiency. But guess potential buyers (mostly in People’s Republic of China) think its enough for the car. Wow SAT – satellite aided transmission !!!! I am curious how the car transmission react in Malaysia . If the car detected the Rolls gotta hit the river or Longkang or Pot hole , the car gear box freezed or always run it at low gear or in car Ecu keep warning ??? . Or Rolls Royce not moving cos our roads are always changing and deteriorating. finally….the car that i’ve been waiting for. been saving since my student days to get this “Ghost”…. You share the same tabung with Rosmah..? kalau kaya….. say beli an island loh. no need to buy this anymore. i am more interested whats new in term of technology? looks S Class has way more bling inside for the passengers than this car, just slight update and called it a new model? rolls rocye are u kidding me? S Class??? Can’t even fight with A8 and now you want to compare with Rolls-Royce ??? Dream on boy. Yup. RR or Bentley they are all no match for lexus. Pure class for the super rich! Proton please rebadge this!!! i wanna buy!! haha.. you want to buy a luxury car with Proton build quality ah? Bentley or RR. Which one is the best? penang state govt. can buy this! cool. dis car like proton. proton oso got sat button. The ads is about rich husband and wife? They should invite fat mama and fat papa to shoot this ads.